Favorite: shows all Recordings which have been marked as a "favorite" over the past 7 days. As soon as you start making a filter with the Filter Builder, you’ll notice the option to Save Segment will appear. Clicking “Save Segment” will allow you to choose a name which describes the filter you created. Who can see a Segment? Segments belong to the whole Organization. 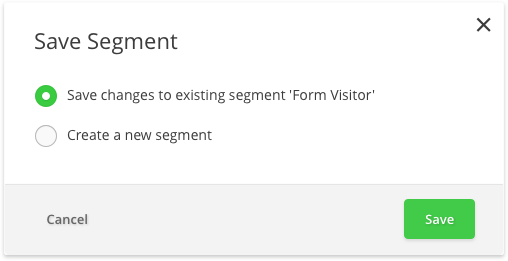 This means that anyone with access to your Site in the Insights dashboard can use your Segments. 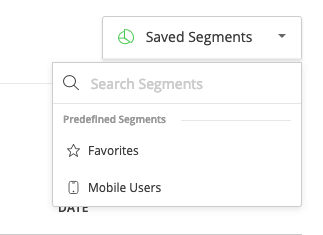 Once you have saved one or more Segments, the Saved Segments menu is added to the Playback List page. This is a drop-down tool which lists your Segments by newest first and allows you to search for the Segment you need. Clicking on a Segment from this drop-down will apply its filters to the Playback List. When a Segment is in use, the menu bar will reflect this. The active Segment name will appear in the menu. The Segment can be deselected by clicking the x icon next to it. This does not delete the Segment, but the filters no longer apply to the Playback List. When a Segment is active, making changes to the filters will show the Save Segment option. By selecting this option, you can choose to update the Segment or create a new one. Click the trash can icon next to the segment in the Segment picker. Click “Yes, Continue” if you wish to complete the deletion.